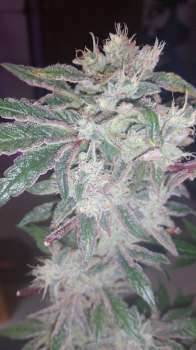 Here you can find a strain description about Jedi Glue and also some user-based reviews and infos directly from the SeedFinder (if available). You can also find the offers and auctions here if Jedi Glue cannabis seeds are on stock at MyCannapot right now. Jedi Glue is a new high THC strain we created using a GG #4 female from my friend Bryan and a big Jedi Kush male. This is a new F2, so there will be a few phenotypes. We expect very high THC levels above 30%. She is a big yielder, as Jedi Kush girls can get very big. The smell of this wonderful cross is a crazy citrus-glue aroma that tickles your nose as well as your fancy! Big, fat very dense and very frosty nugs makes this a definite keeper strain! Jedi Glue is great for pain relief, insomnia, gastrointestinal issues, AIDS, stress, and ADD. Also good for PTSD. Flowering time: 60-65 days. Buy Jedi Glue now at MyCannapot!